MINIs are small, but not that small! A full-sized MINI nicknamed Tweedi, back, dwarfs "mini" Mini Tweedi. The pair are owned by Barry and Alice Rathe. In the beginning there was an oil shortage, and the price of gasoline was high. Sound familiar? It was the mid-'50s, and the Suez Crisis tamped off Mideast oil. The British Motor Corp. responded by designing a subcompact with the engine turned sideways to maximize internal space. It was a revolution in car design that echoes today, a car designed for efficiency and comfort that leaves a small footprint. The Rathe's MINI also features airbrushed cartoon eyes in the engine compartment that are so well done they've inspired a decal manufacturer to imitate them. 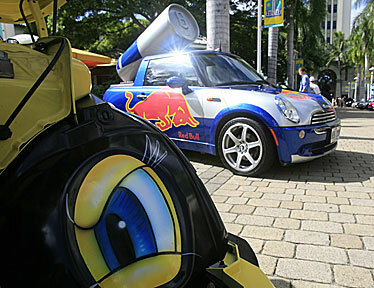 Also in the line-up is the promotional "Red Bull" MINI Cooper, a familiar sight on Honolulu streets. The car struck a happy chord with European driving enthusiasts and was soon manufactured in several countries and collectively called the Mini, a silhouette so familiar it became trademarked. Motorists enjoyed the go-kart-like handling that made it fun to drive, and a souped-up version was produced by designer John Cooper. 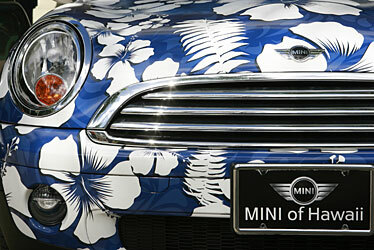 The Mini Cooper became the darling of celebrities and action movies during the '60s. Production of a bewildering variety of editions continued to the turn of the century, and then the Mini was retired. In 2001, designers at Germany's BMW vamped on the original concept to create the MINI, somewhat larger, swankier, more elegant, with the name spelled in capital letters to distinguish it from its ancestors. 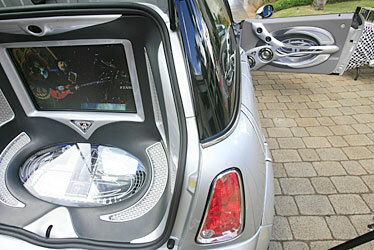 IslandSound's Earl Shimabukuro shoehorned a massive audio and DVD system into the back of Karl Kawachi's MINI, for use in car shows to promote his products. The system is so massive that it blocks the rear, so it's rigged with a built-in camera and LCD monitor to provide the driver with a rear view. "And yet, when you close the doors, you barely hear the sound," said Shimabukuro. "That's the sign of a solid car." Both new and old editions have their fans. Joey Aquino was tooling down the highway recently in his right-hand-drive 1970 "Italian Job" Mini when another car began chasing him. "They finally caught up and pulled alongside," laughed Aquino. "And there were four guys hanging out, shooting pictures of my car with their cell phones and giving me the shaka!" Aquino's Mini was one of the older cars on display this weekend at a rally at Aloha Tower sponsored by Mini of Hawaii and the Hawaii Mini Motoring Club. Many of the cars were juiced-up, street-legal rods; some were showcases for high-end audiovisual installations; others were simply pampered and beloved family transportation. 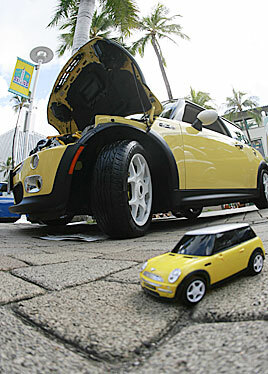 This Hawaiian MINI got the aloha-shirt treatment at the 2007 MINI Auto Show Sunday at Aloha Tower Marketplace, sponsored by MINI of Hawaii and the Hawaii MINI Motoring Club. "Reliable as heck, and it's safe. Bluebook value is more than I have left on the loan!" enthused John Cummings, whose tolerant wife puts up with dozens of Mini model cars and paraphernalia. "British and German design with a South American engine -- way more fuel-efficient than my other car, a 1975 Cutlass Supreme ..."
Both Mini and MINI owners absolutely agree on one thing. "It's a car that meets your expectations of being able to park anywhere," said Cummings. "And I do."